JOY and tears flowed in Highgate on Sunday as two Hampstead Football Club teams enjoyed mixed fortunes in their bids to secure Harrow League Cup semi-final glory. Hampstead’s under-16s faced off against Kodak, while the under-12s battled rivals Harrow St Mary’s on the next door pitch at Hurst Avenue. But while the under-16s cruised to victory over Kodak, the under-12s suffered penalty shoot-out agony against Harrow after extra time failed to separate the two teams. 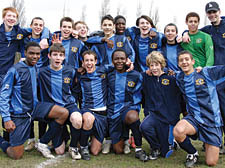 Cheered on by their victorious senior club mates moments after celebrating their 4-1 triumph, Hampstead A stepped confidently up to the penalty plate. But despite the heroics of goalkeeper Conor Jones, who scored and saved in the shoot-out, the under-12s suffered heartbreak from the spot. Mahlon Romeo had given the Blues the lead early on in the match, but Harrow’s Adegoye Adewale had levelled with a long range free kick. Both sides had chances to finish the tie in extra time but it was Harrow who made it through after a nail-biting finale to a thrill-a-minute match. Hampstead’s under-16s had made lighter work of their tie, Ashley Peterson setting his side on their way before Ahmed El-Khasassi bagged a brace either side of the break. Conor Reidy added a fourth as Kodak continued to chase the game but Drilon Kika’s goal proved to be a mere consolation. • ISLEDON Wolves continued their winning form as skipper Aiden O’Brien led his side to a 3-0 win over Pittshanger in the Under-14 Division Two of the Harrow League. A cracking corner from Billy Horan led to a goal from Ishmael Koroma. O’Brien fired in a second before half time and Keitel Frankle sealed it with a third in the second half.